An important aspect of turning your photographs into art is printing them. 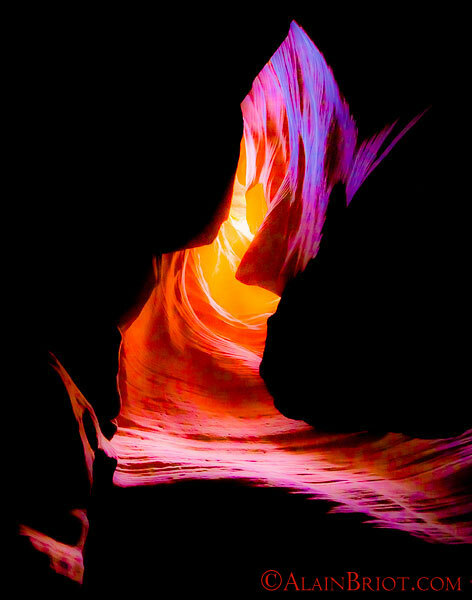 Printing is necessary because fine art photography is both a digital and a physical artistic medium. 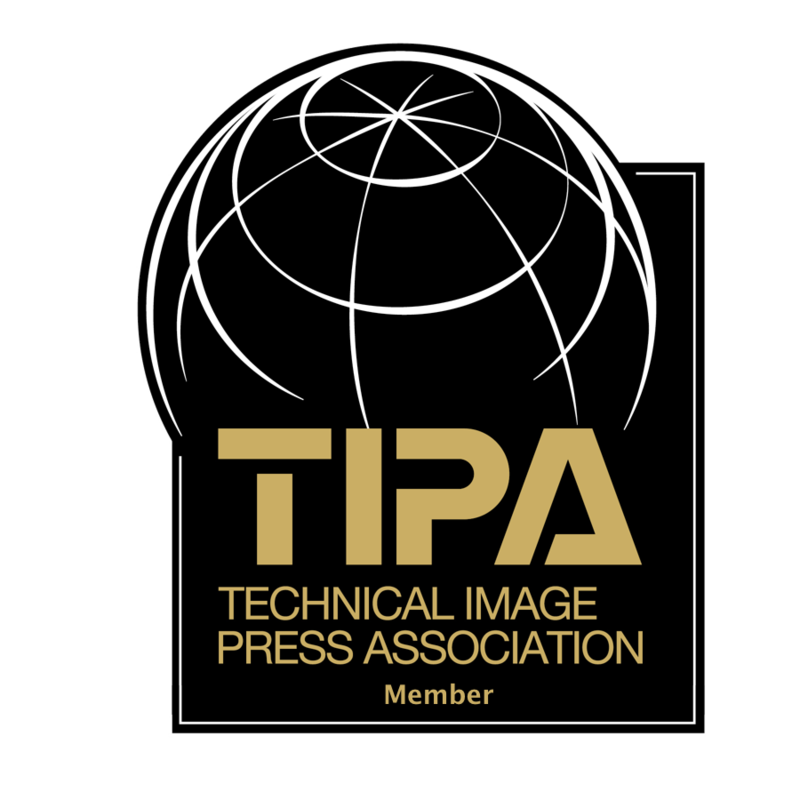 In the case of photography, the physical medium is a digital or a chemical print. In the case of other mediums, it can be a painting, a drawing, a sculpture or any other object or physical creation. While today we can share digital photographs on the internet and view them on a computer monitor or on a variety of digital devices, art shows, galleries, museums and other locations where art is displayed or sold still require physical prints either matted, framed or mounted on a metal, wood or other support. You can print your work from Photoshop, Image Print and from just about any other software package. You can also print your work from Lightroom and doing so is the focus of this essay you are reading now. This essay features a detailed account of the Lightroom Printing Module. This account follows my workflow and it is organized in the order in which I use each dialog box when I print my photographs. This essay will be published in three parts numbered A, B and C. Part A focuses on selecting, editing and creating a layout. Part B will focus on using Templates and Soft Proofing and part C will focus on color management and printing on the Epson SC-P600. This series of three essays is part of my Artistic Lightroom Mastery Workshop on USB or DVD. This extensive mastery tutorial covers all aspects of Lightroom starting from image management and selection, continuing with image processing and optimizing and concluding with proofing and printing your photographs. You can view a detailed table of contents here together with a special offer for Luminous Landscape readers. 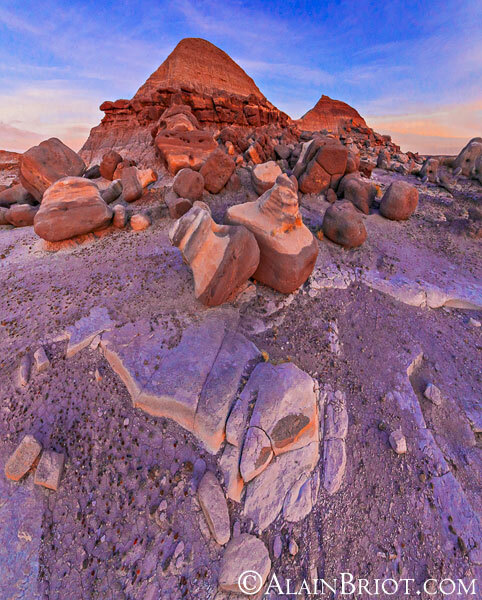 This photograph was processed entirely in Lightroom, from the raw file to the final print file. 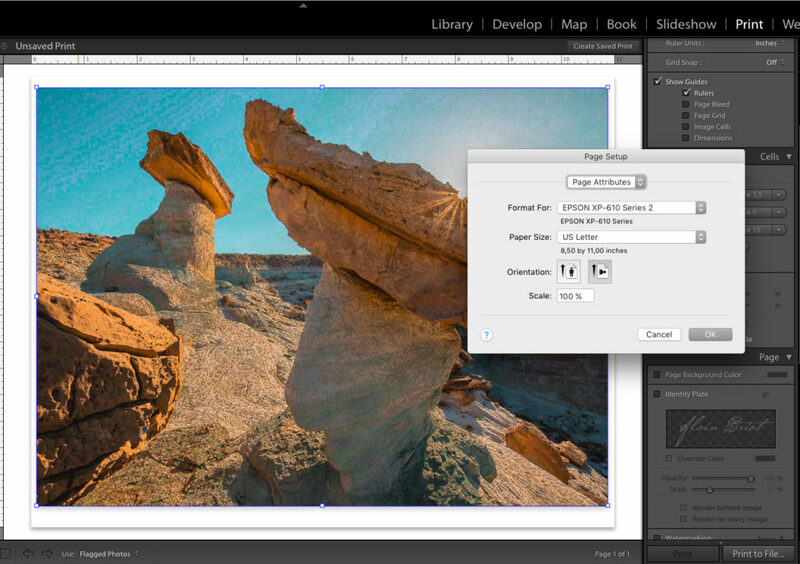 Before you can print from Lightroom you need to select the images you want to print. You do this by choosing a Collection from the Collections palette. This means that before you can print you need to create a collection of images because the Image Folders menu is not accessible from the Print menu. 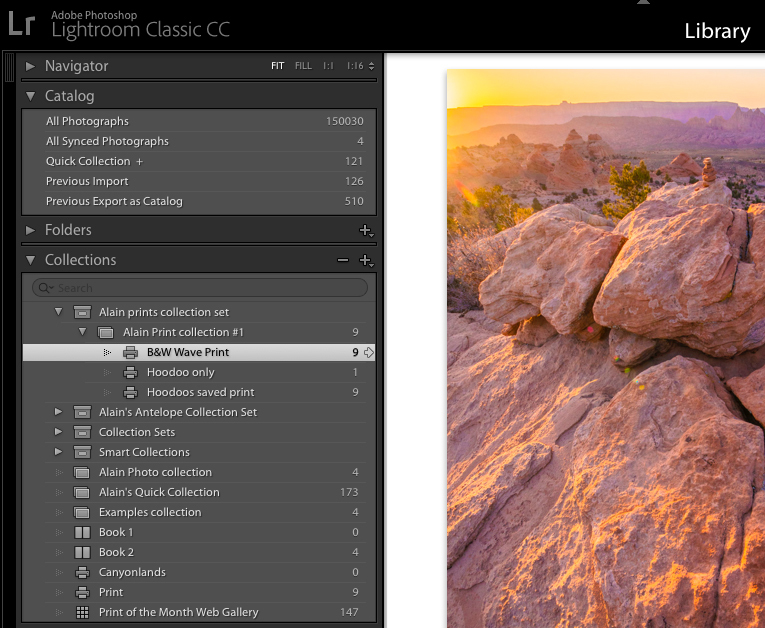 In Lightroom, an image collection is a folder in which you place a selection of images. You start by creating a Collection, naming it and adding images you want to have in this specific collection. To maximize workflow efficiency I recommend you create a collection that you name “Print Collection” plus the name of the location, subject or date to make it easy to find if you have several print collections. – Selecting Flagged Photos will show only the photos that you have flagged, meaning photos for which you set a Flag ranking in the Develop or Library module. The three selection options determine which photos are displayed in the filmstrip and which photographs will be printed. Here I selected the Flagged Photos option. Use All Filmstrip Photos to print all the photographs in the filmstrip (the Filmstrip is the row of images at the bottom of the Lightroom interface). When you select this option all the photographs in your collection will print even if you select only some of the photographs. 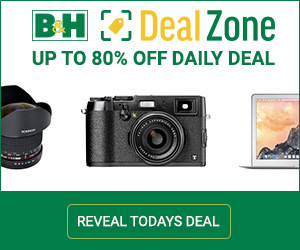 Pressing the command key while making a selection does not allow you to select only some of the images. Use Selected Photos to select only some of the images. If you need to select photographs that are not next to each other you can do so by pressing the Command key (for Mac or the Alt key for Windows) while clicking on the photographs you want to select. If you do not press the command key while you are selecting images you will only be able to select photographs that are next to each other. Use Flagged Photos to print all the photographs you flagged. When you select this option all the photographs will print even if you select only some of the photographs because pressing the command key will not allow you to select only some images. I personally prefer the flag option because it allows me to make a selection of images specifically for printing. For that reason, I use mostly the Flag Photos option to filter the images I want to print. 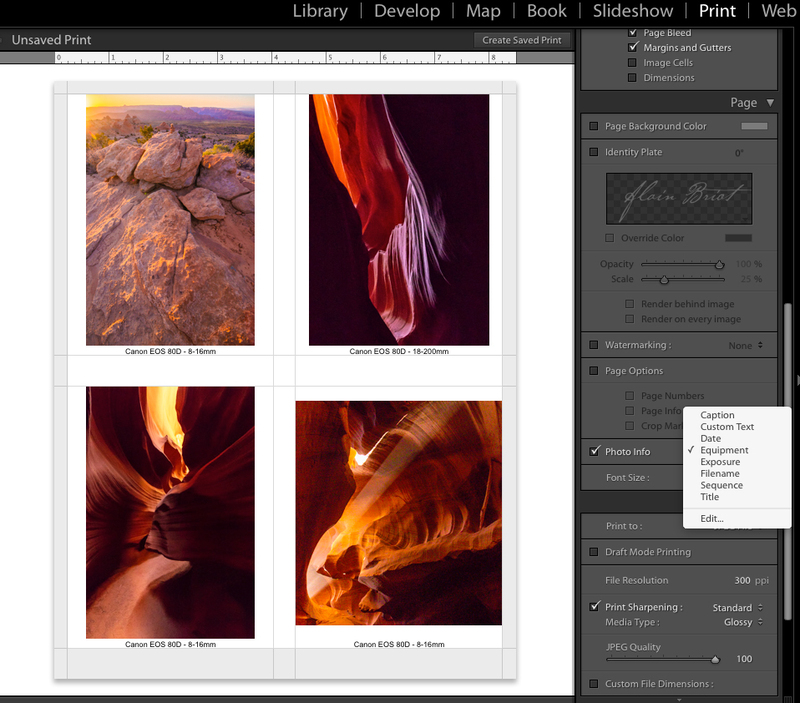 You can continue editing the images in a collection after you started working in the print module. Placing your cursor on a print collection in the Library module will bring up a small arrow on the right of the collection name. Clicking on this arrow will take you directly to the Printing Module where you can make further image adjustments. Placing your cursor on a print collection in the Library module will bring up a small arrow on the right of the collection name, next to the number of images in the collection. Clicking on that arrow will take you to the Develop Module. 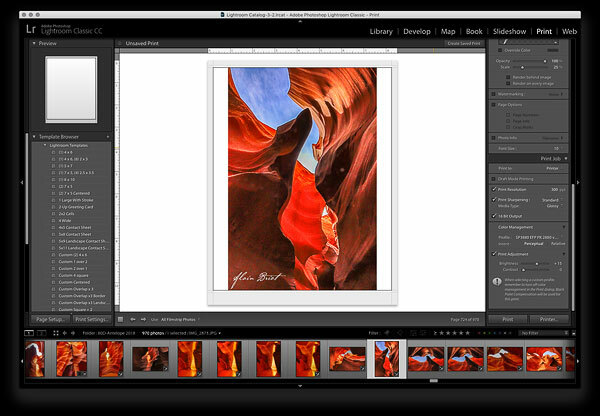 The Lightroom Layout Styles dialog boxes control how your photographs are placed on the printing page. Lightroom features three different Layout Style options. These layout style options are located on the right side of the printing module. The three Layout Style options in the Layout Style dialog box. The print layout is the process through which you prepare your images for printing in regards to how they will look on the page. This includes the print size, the page size, the page direction and more. There are two ways to set the paper size. 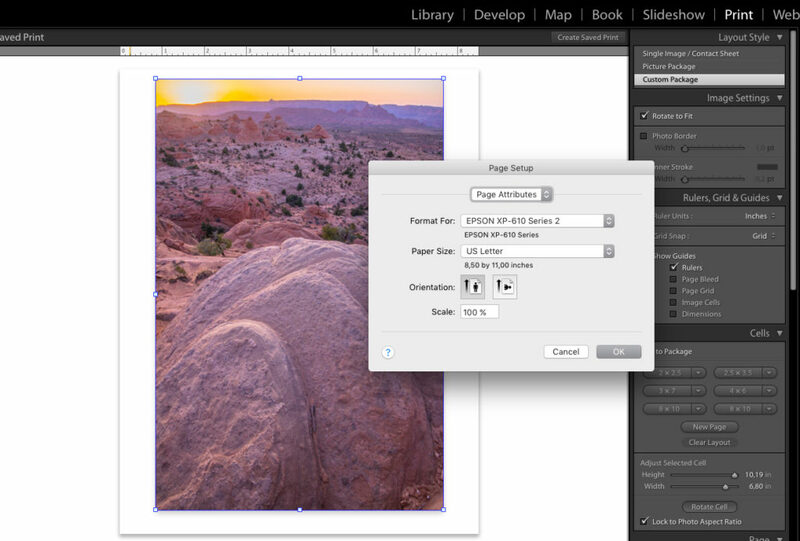 You can set the paper size in Lightroom by selecting a Lightroom template that features the page size you want to use. 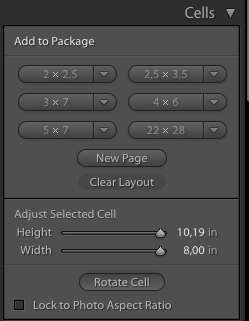 Or you can set the paper size in the printer dialog box by clicking on the Page Setup button at the bottom left of the Lightroom interface. This button opens the printer dialog box in which you can either select the paper size or enter a custom paper size. In practice, I often end up using both. 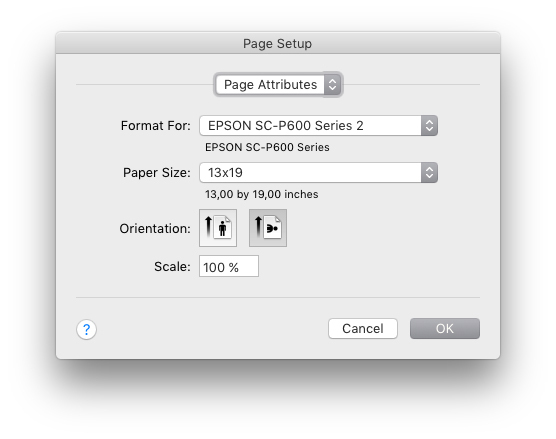 I start by using a template with the paper size I want to lay the print onto and I continue by setting the same paper size in the printer dialog box. The Page Setup and Print Settings buttons are located under the Collections palette. 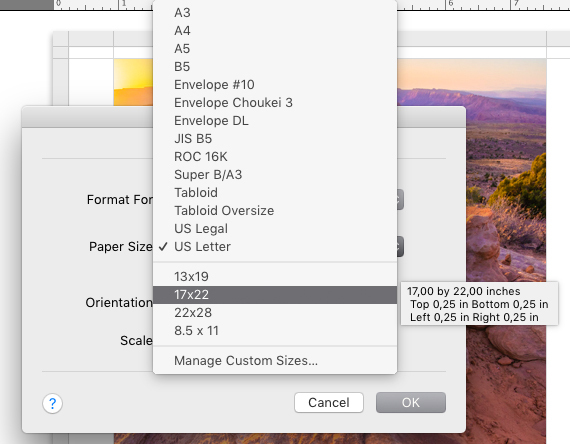 The paper size options in the Print Setup dialog box. The page orientation can be set to either horizontal or vertical to accommodate images that are vertical or horizontal. This is set by clicking on the Page Setup button at the bottom left of the Print module. This button opens the printer dialog box in which you can select a vertical or horizontal page orientation. Horizontal page orientation selected in the Printer Page Setup dialog box. Vertical page orientation selected in the printer Page Setup dialog box. A cell is the frame in which you place your photograph. Lightroom gives you the option of having a single cell on your page, the size of your print, or to can have two or more cells on your page, to either print the same photo in different sizes on a single page or to print different photographs on the same page. When creating a Custom Package you can add cells from the Cells palette. You can also control the size, rotation and aspect ratio of these cells in the same palette. When you add multiple cells they may overlap each other. To organize them the way you want you can move them forward or backward by right-clicking on the cell and selecting the option you want from the drop-down menu that comes up. You can also rearrange the cells by dragging them to the location of your choice on the page. The Move Cell options. You access this menu by right-clicking on a cell in the layout window. You can have Lightroom include information under each photograph according to the choices you make in the Photo Info drop-down menu (you need to right-click on Photo Info to access this menu). 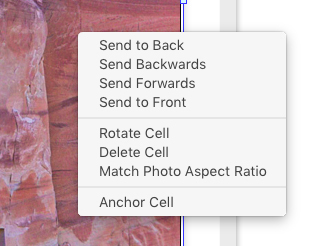 The Photo Info drop-down menu. Open Lightroom, load some of your photographs and practice the tips outlined in this essay. Because this essay is presented as a set of instructions, it will be much easier to follow if you are working in Lightroom while you reading it. This series is a suivre and you do not want to miss the next episode. Part B will continue this series on printing from Lightroom with a tutorial on how to use Lightroom Templates and Soft Proofing functions. I create artistic photographs and I teach students how to create artistic photographs. 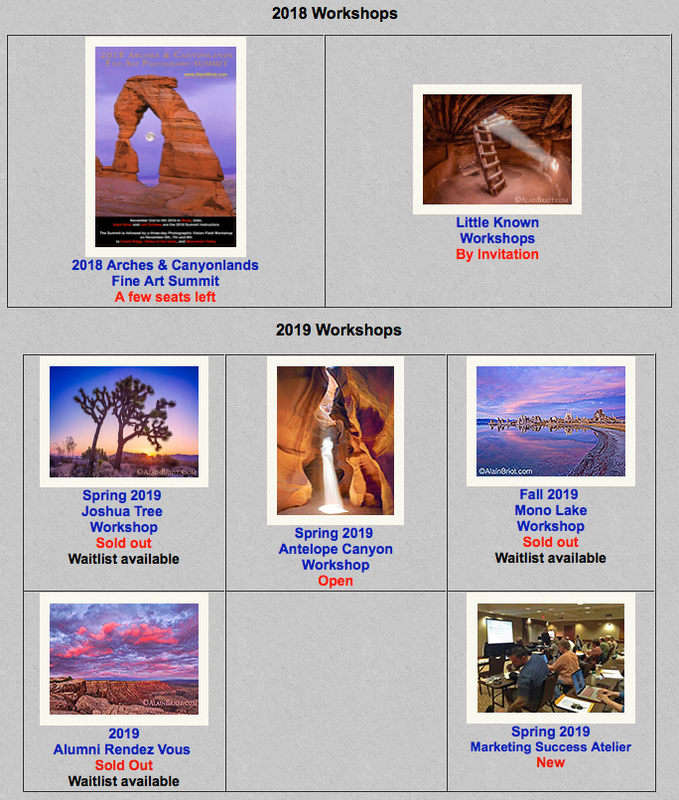 To this end, I teach field workshops and classroom seminars with Natalie and I offer Mastery Tutorials on composition, image conversion, optimization, personal style, printing, business and marketing.